We, as co-op loving gamers, love a good fight. Especially one where we're pitted against the odds with friends, and the difficulty challenges us with each wave. Horde Mode in Gears of War 2 has kept us busy for months now. After we're done with the new Horde DLC, we'll be ready for more. 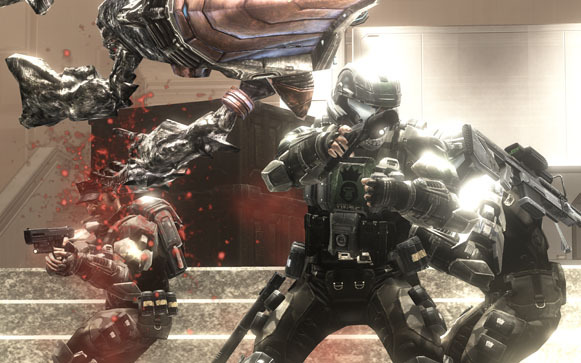 Halo 3: ODST has it's own variation on Gears of War's Horde Mode, called Firefight. We've had a few minor encounters with what Firefight details, but now Gametrailers.com has a visual aid to help. Firefight mode will be different than anything we've seen in the Halo franchise for a number of reasons. First, There will be 4 players working together to ensure the groups survival. Second, you will not be donning the armor of the Master Chief, which presents it's own challenge to the game. As a non-masterchief ODST soldier, you are vulnerable to attacks while unable to recover your shields simply by flexing. In fact, you won't be recovering shields at all, so be careful where you step. ODST are also unable to duel wield most of the weapons in the game, so you'll want to conserve ammunition accordingly! Finally, you won't be able to get comfortable with the usual surge of Covenent entering the scene. Each wave will produce stronger, better units to ravage your small team of ODST. Don't believe us? Well, that's what the San Diego Comic Con hands-on video is here for! Watch the players fight, and die valiantly with each wave. We'd almost be able to recommend sticking together just based on this video - yea, I'll do it anyway. Stick together to stay alive! Firefight mode is shaping up to be a highly anticipated co-op feature, in a favored gaming franchise. Well, you know what they say - it's always best to fight fire with bullets. How long will you survive? Page created in 0.7990 seconds.